Depth Security is a different type of information security company. 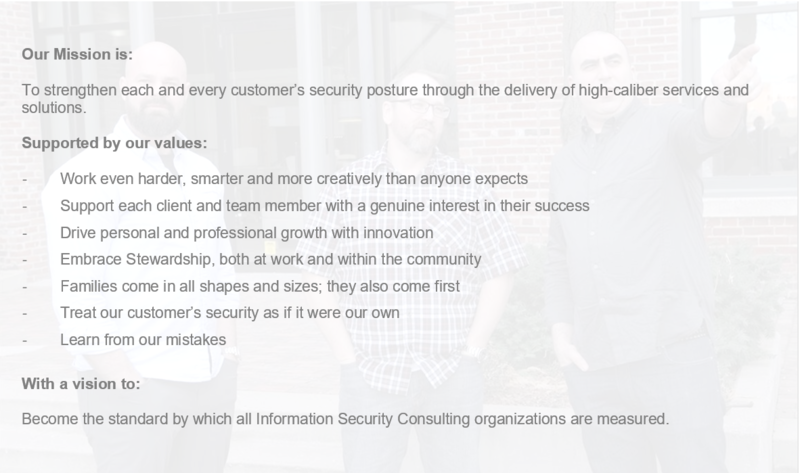 We were founded by a small group of experienced information security engineers and are still run by the same team today. Our company culture is deeply anchored in experience, creativity, and talent. Unlike many of our competitors, we've spent decades in the trenches of IT security, not 50,000 feet up in the clouds. We've been key players at some of the largest IT security organizations and led some of the best corporate information security teams for enterprise organizations. We not only designed next-level information security solutions, but we also built them and were responsible for the day to day in some of the most challenging environments. Most importantly, we've walked in our customer's shoes and we understand. When you engage Depth Security as a trusted information security partner, you gain access to our full range of consulting services. We leverage our experience, knowledge, and contacts to make you successful.